On February 1, 2004, there was great rejoicing among residents of the border towns of Abohar and Fazilka in Punjab when the foundation stone of a massive railway project linking the two towns was laid by Nitish Kumar, the then Union Railways Minister, and now Bihar Chief Minister. Estimated then at Rs 86 crore, the project involved construction of 42.11 km of railway tracks between the two towns, five new stations and 29 level crossings, besides houses for rail employees at each of the new stations. The project was to be completed in 2007 and trains were to ply on the route the same year. The project has become a prime example of official neglect and apathy. Eight years later, the trains are yet to start running between the two towns though the five stations, the rail track and the 29 level crossings were largely completed by 2007. The cost by then had ballooned to Rs 276 crore. Every passing year, the liability in terms of damages and non-provision of services that constitute return on revenue is mounting. When The Tribune visited the station in Churhi Wala Dhana, 5 km from Abohar, on June 23 it wore a desolate look. While the platform had been built and the tracks laid in 2007, both have remained unused. The station presents a dismal picture of neglect with thick vegetative growth and most of the sanitary and electrical fittings either vandalised or pilfered. At places even the floor of Platform Number 1 has caved in. The ramp leading to the platform number has been damaged beyond use. Similar situation prevails in four other stations, including Jandhwala Kharata, Khui Kherra, Ghalo and Burj Mohar, that connect the two towns. Passenger facilities like drinking water, toilets, passenger benches and shelters have been vandalised. Fishplates of tracks, clamps, check rails and nuts and bolts have been either damaged or stolen. The signal boxes have caved in requiring total replacement. Khui Kherra station: cracked platforms speak of official neglect (left) and links go bad: Damaged signal network at Burj Mohar (L) and Khui Kherra stations. Ironically, the Railways Ministry did not seem to be aware of the sorry state of affairs. Last year it blissfully announced the start of train services between the two towns and even included it in the official time table released in 1 July 2011. It’s been a year and no train has chugged on these tracks or any personnel hired to man the five stations and the 29 level crossings that are ready. The shocking state of affairs has evoked strong protests not only from rail users but also a number of other bodies, including Beopar Mandal and social welfare organisations of both Abohar and Fazilka, who have formed the Sanjha Morcha to take their battle to its logical conclusion. The Sanjha Morcha members point out that there would be huge savings for each family if the trains ran. 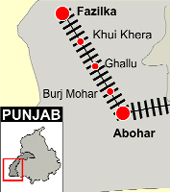 Currently they are paying Rs 23 to travel by bus from Abohar to Fazilka and if the trains ran it would cost them Rs 6, according to the official Railways timetable. The Morcha charges the Railways of being in collusion with powerful private bus transport lobby in Punjab for not starting the service. Spearheaded by Dr Amar Lal Bagla, Rajpal Gombhar, Raj Krishan Kalra, Comrade Shakti, Sushil Gombhar, Ashok Gulbadhan, Ramesh Vadhera, Satish Dhingra, Surjit Singh, Amrit Kreer, Jagdish Chander Kataria and Mohinder Partap, the Sanjha Morcha has started a hunger strike from June 1 agitating for the Abohar-Fazilka service to be made operational. “We are not going to relent. How can an organization like Railways allow its property to be pilfered, vandalised and remain out of use for such a long time. Probably there is no audit control. An independent inquiry must be held to find out why the promised service was not introduced and how come such a huge public investment was allowed to be plundered by anti-social elements?” asks Amar Lal Bagla, president of the Northern Railways Passengers Association (NRPA). The Sanjha Morcha has already made representations to the Union Railway Minister, Railway Board chairman and Northern Railways general manager. Bowing to public pressure, the Railways Ministry now claims it will start the train service from July 31 this year. It has become hyper-active. Hundreds of workers have been at work to repair the damaged infrastructure. At every new railway station, workers are busy replacing fishplates, clamps, check rails, nuts and bolts and removing damaged panels, batteries and control panels. Ferozepore Divisional Railway Manager NC Goel: “All I can say is that this train will start by July 31 this year. Railways have spent over Rs 200 crore on this project. We have identified the staff for the new stations, level crossings and will post them at appropriate time. I cannot say off hand how much loss Railways incurred because of delay in starting the service. There are no confirmed dates for the inspection of the track and facilities by the Commissioner of Rail Safety.” Besides ordering a massive renovation and repair operation of the tracks and connected infrastructure, it has also identified staff to be posted at the new stations and level crossings. While Railways had advanced shortage of staff as one of the prime reasons for delay in commissioning the service, it has now decided to withdraw surplus staff from other areas. It has also put pressure on the Commissioner of Rail Safety for an early visit to the site for clearance. It is only the Commissioner of Rail Safety who after inspection will determine the security and safety of the service besides recommending speed at which trains would run on this new track. Though officials refused to confirm the dates for inspection, those on renovation work have been told that much awaited inspection would take place by the end of first week of July, tentatively from July 4 to 6. “We are still keeping our fingers crossed till the service is actually made operational. We have our serious doubts that it will be ready,” adds Dr Amar Lal Baghla.